- 1 bulb of garlic. - 2 blood sausage (black pudding). - 4 or 5 rasher of bacon. - 100 g of boiled chickpeas. - 150 ml of olive oil. - Salt, saffron and sweet paprika powder. Our recommendation is to cook this rice with a enamelled casserole of 34 cm. Enamelled casseroles are suitable for induction, vitroceramic hobs, gas and also oven. Heat a little olive oil in a casserole and fry lightly the potatoes and garlic with salt. Place the pieces outside and then fry lightly the sliced tomato and pancetta or bacon and place them outside too. Now fry the chop until golden brown on both sides and add the blood sausages. When this it´s ready add the rice, the boiled chickpeas, saffron, salt and sweet paprika powder and remove them. Pour the water and put the potatoes, garlic, bacon and tomato in the casserole, distributing them very well all over on the rice. 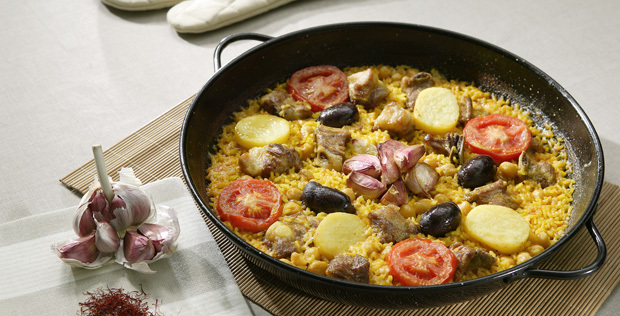 Place the casserole in the oven and bake at 220°C for 20-25 minutes to dry the rice. You’ll love it!